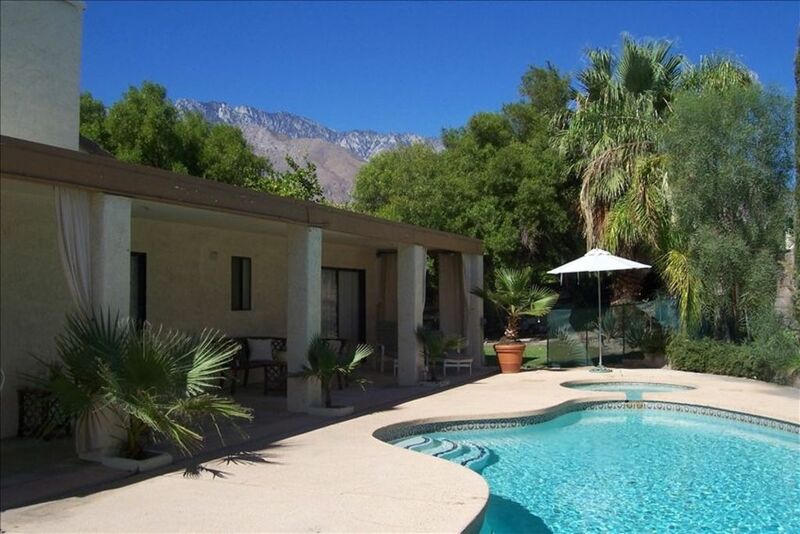 Perfect Palm Springs vacation home, for a wonderful seasonal or extended stay. Elegant interior with travertine floors and kitchen with bar/counter, granite fireplace, and vaulted ceiling. All new furnishings, comfortable, tasteful and stylish. Complete privacy in the backyard with heated pool and spa, absolutely no overlooking neighbors! Large grass side yard ideal for croquet, badminton or other games. Mature palm and fruit trees - pick your own grapefruit for breakfast! Beautiful mountain views and sunsets, no unsightly overhead power lines. This Non-Smoking Home is at the end of a cul-de-sac, private and quiet. Very convenient to downtown Palm Springs in the established Movie Colony section. Fully appointed. New on the market, very affordably priced below market rates for comparable homes. You will love this home! Master bathroom en suite with double sinks, oversized tub with rain shower. Second bathroom with walk in shower, non-slip tiles - access from the bedroom hallway for two guest bedrooms. Vaulted open living room with travertine floors, Room and Board sofas, Grace Home carpet/decor and original art. Large side-by-side fridge/freezer and ice machine and water filter system. Electric coffee machine and stove-top espresso maker. Fully loaded kitchen! Everything you could possibly need in the way of china, glassware, serving pieces, pots and pans, cutlery and pool ware. Large grassy yard surrounded by fruit trees and mature palms. Local public courts five minutes walk in Ruth Hardy Park. We really liked the house for the most part. The living room and bedrooms were very comfy, and the backyard is beautiful! We really enjoyed the pool, grilling, and lounging in the grass by the lemon tree. Our only complaint is that the house could benefit from replacing some old items. I think the house needs a little updating such as the patio table and chairs that seem a little worn out. We would definitely stay in this house again should we return to Palm Springs. Also, the house is very family friendly with a toddler bed as an option or a travel crib. We stayed here with our two dogs in February and March 2019. This is an older home located on a quiet cul-de-sac, very spacious and comfortable, i.e., the beds and linens are good quality, showers have decent pressure, kitchen is fully stocked with everything you need. We loved the pool and spa, and our dogs enjoyed playing in the beautiful, grassy, fully fenced back yard. Philippa was welcoming, gracious and very responsive regarding any minor issues we had. Highly recommended. Jonathan and Philippa have a beautiful home that is well-maintained. Check in was easy and my fiancé and I enjoyed our trip. We will definitely consider staying here again. It was a pleasure. We arrived and the pool was green. They did not send anyone to fix this until the late afternoon. So we missed a whole day of swimming. The house needs a lot of attention. Some faucets did not work. The fixture in the master bathroom broke while in use. There were dead roaches throughout the house. The yard needs a lot of attention as well. Over all, pretty disappointed for the money we paid. I do not recommend this place. Spent the weekend here in April. Location is close to downtown area. Nice spacious kitcken and living room. It was easy to cook up breakfast and lunch for our group. The pool was nice and you can heat it if needed. We were mostly out in the town, so I wish I got to enjoy the pool more. The owners were quick to reply to any questions. Would recommend. The house is great.thank's to the host we were able to check out late,after our round of golf.